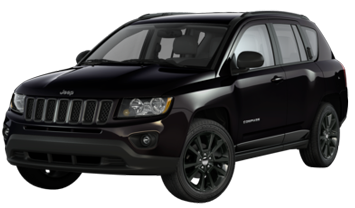 Jeep debuted the production version of the Compass at the 2006 North American International Auto Show in January. The first Compass was assembled on May 30, 2006, in Belvidere, Illinois, where the Dodge Neon was produced. The Compass did not carry the "Trail Rated" badge found on other SUVs in the Jeep family for the 2007-2010 model years, but received the "Trail Rated" badge for the 2011 model year. This indicates that the Compass targets first-time Jeep buyers and those who drive primarily on paved roads. The Compass and Patriot are both based on the DaimlerChrysler/Mitsubishi GS platform. These vehicles are differentiated by their styling and marketing: The Patriot is a traditionally styled 4-door Jeepwagon, while the Compass shares a more hatchback look, similar in terms to the Dodge Caliber.